It has come to my attention that there exists an award-winning Broadway musical based on the life of Alexander Hamilton. 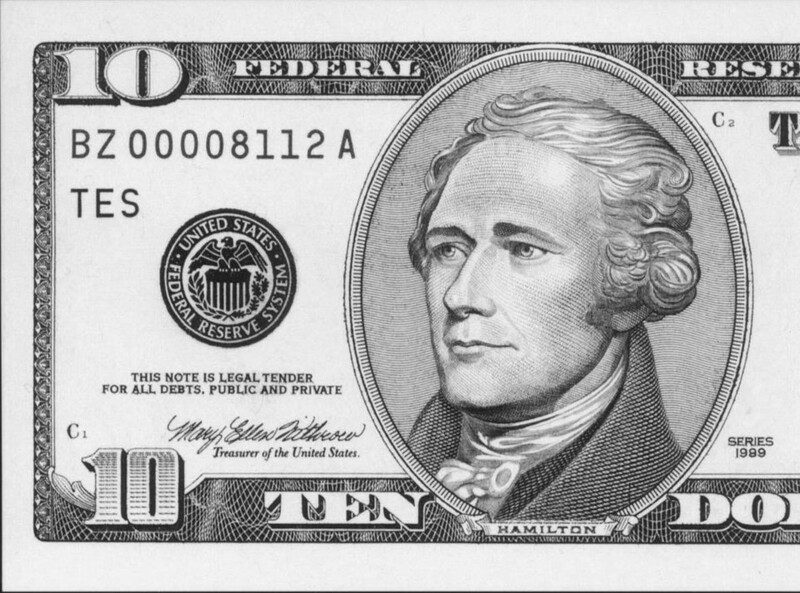 Additionally, I recall an announcement a few months ago by the Secretary of the Treasury, Jack Lew, that a woman will be chosen to appear on our paper currency for the first time ever in 2020, replacing or “sharing” the $10 bill’s Alexander Hamilton. There has been a long-running campaign by activists to force the Treasury Department to consider featuring a woman on paper currency. America is one of the only developed countries that has never featured a single banknote adorned with a woman’s face. One of the campaigning groups, Women on 20s, recently had an open election on which woman should be honored, with the winner being the ex-slave heroine Harriet Tubman. I fully endorse this selection, and one of my other top choices would have been another ex-slave Sojourner Truth, a formidable speaker and advocate for freedom and universal rights. These choices highlight both the rich and checkered history of America and its diversity more than any of the current ex-President standard-bearers. From the beginning there were two very large opposing stake-holders in the new nation, which was only formed out of compromise between the two: northern industrialists and merchants, and southern agrarian slaveowners. This otherwise irreconcilable opposition was infamously ignored in the U.S. Constitution, all but guaranteeing that the issue would eventually be settled by force of arms, as was the case nearly a century later with the Civil War. After the initial presidency of Washington, who was basically neutral and above party politics, and the brief tenure of John Adams, the southern states held sway for the next several decades. For over 40 years from the presidencies of Jefferson to Jackson, the interests of the slaveholders were protected in the name of (ironically) individual freedom and state sovereignty. America itself was largely built and enriched with free labor on the backs of slaves. Like all systems of violent exploitation, this was one that could obviously not be sustained forever, and the cracks began to show in the 1840s, growing wider and wider until the southern states finally declared war out of economic and political desperation. But who should we choose to replace on our currency? After Washington, Adams, Jefferson, and Madison, Alexander Hamilton was probably the most important founding father of the United States, and the only one to not serve as president. He was also the only one who was fully a self-made man, being born illegitimately in the West Indies to a Scottish trader and a French mother, and rising in the ranks to Washington’s aide-de-camp due to his political and journalistic talent alone. He was by far the most important contributor to the Federalist Papers, the series of essays that had profound influence in pushing America towards ratifying the stronger federalist constitution it still abides by today. He was the architect of the capitalist economic system that America maintains today, just as Jefferson was the architect of a much-changed democratic system. Both systems have pros and cons and are not mutually exclusive, though they have been politically opposed since the early days of the republic. Jefferson’s system of democratic individualism was good for the agrarian southern states and the rapidly expanding western states. The name has always been somewhat a misnomer, as the franchise was initially reserved to wealthy white landowners, and only gradually to all white men, to the emancipated male slaves (in theory if not in practice), and, in 1920, to women. That political operatives are still trying to suppress and buy votes in any way possible in 2016 shows an inherent weakness of democracy itself and the limitations of the high-minded Jeffersonian project. Hamilton, as the leader of the Federalist party, was an enemy of Jefferson, and his political project did not long survive his 1804 death by duel (killed by Aaron Burr after being instrumental in blocking Burr from becoming U.S. President in 1800 and New York governor in 1804). His economic system, as we will see, was placed on much firmer ground and lives on today in our banking and capitalist wealth. Hamilton’s system allowed for corruption and concentration of wealth, which came to fruition quickly, and especially in the years of the industrial robber barons, almost as great as any ever seen. The financial centers of the east coast allowed the capitalists to effectively control the entire country economically, even if the southern “democrats” long held political power. The wealth and population of the North powered it to a win the war of attrition over the Southern slave states. At this point, the economic and democratic systems of Hamilton and Jefferson converged, combining both their positive and negative attributes. The democratic franchise was expanded, but the economic might of the industrial north also gained more political power, which it has arguably held, with ups and downs, to the present day. This lead it to become the wealthiest nation in the world by 1880 and continuing to the present day, with no short-term end of this reign in sight. At the same time, the overall wealth of this America was only grudgingly granted, after countless worker uprisings and hard-fought union activism, to its middle and lower classes. The out-of-control inequality finally caught up to the capitalist classes with the Great Depression, which swept in Franklin Roosevelt’s New Deal and a 50-year window of rising middle-class prosperity. Even this was achieved in spite of the continuing undemocratic discrimination against Blacks, which had never seen the economic or political freedom promised by the Emancipation Proclamation and the defeat of the Confederacy. One of the biggest changes in the public discourse in the last few years has been the widespread realization, distilled in the Occupy Wall Street movement, of the unacceptable state of income inequality. America’s economic system has reverted back towards the corruption and concentration of wealth planned by Hamilton, and championed ever since by the J.P. Morgans and John Rockefellers of yesteryear to the unaccountable Wall Street banks and multinational industries of today. Thomas Jefferson was a deeply flawed human who was nevertheless America’s most cultured and intellectual president ever, and the visionary of its flawed and imperfect democracy. Alexander Hamilton was also a deeply flawed human who was one of the most influential forces in establishing America’s powerful, unprecedented, and very imperfect economic system. On the other hand, Jackson is easily the most dubious of all the current monetary placeholders on moral grounds. Even if Washington, Jefferson, Madison, and all the other southern president were actual slaveowners, Andrew Jackson was certainly one of the most violent and racist of all our presidents. He was a well-known warrior and killer of Native Americans in countless wars, was a notable slave-trader, and is single-handedly responsible for some of the most horrific episodes in American history against the Natives. Both Jefferson and Hamilton represent the good and bad potential of America itself and its uneasy relationship with democracy and money. In this latest political campaign season of populism and rising economic inequality, the best we can hope for is for the best aspects of both systems to be more fully realized with the consent of the citizens. Maintaining a functioning democracy that prioritizes justice and fairness is not easy, but is still very possible in an imperfect but hopeful America. Jackson represents the worst of these tendencies combined. That should be sufficient grounds to select Andrew Jackson as the first paper currency representative to be demoted to living just in history books rather than in our daily monetary transactions. The symbolism of replacing him with a woman would be stronger than with any other, not to mention the fact that choosing the $20 bill itself gives a greater place to the cause of sexual equality. It is not only a more valuable bill than the $10 but also in much greater circulation. If we also consider the relevant fact that Jackson detested and fought vigorously against the very idea of a National Bank and national currency, while Hamilton was the strongest earlier proponent of both, it makes more sense to keep Hamilton at least for a time and get rid of Jackson immediately. America is also one of the few western countries that honor politicians and presidents above all on its currency and public facilities; you will therefore find a noticeable dearth of cultural, literary, intellectual, scientific, or philosophical names in these places. Why not Mark Twain, Herman Melville, or Walt Whitman; or Harriet Beecher Stowe, Emily Dickinson, or Louisa May Alcott; or Ralph Emerson, John Dewey, or William James; or Rachel Carson, Rosa Parks, or Phillis Wheatley; or Louis Armstrong, Ella Fitzgerald, or Duke Ellington? Any of these and a host of others are all more interesting and culturally relevant than the handful of tired, flawed ex-presidents. I do support Harriet Tubman, in any case, as a great choice to adorn the $20 bill.